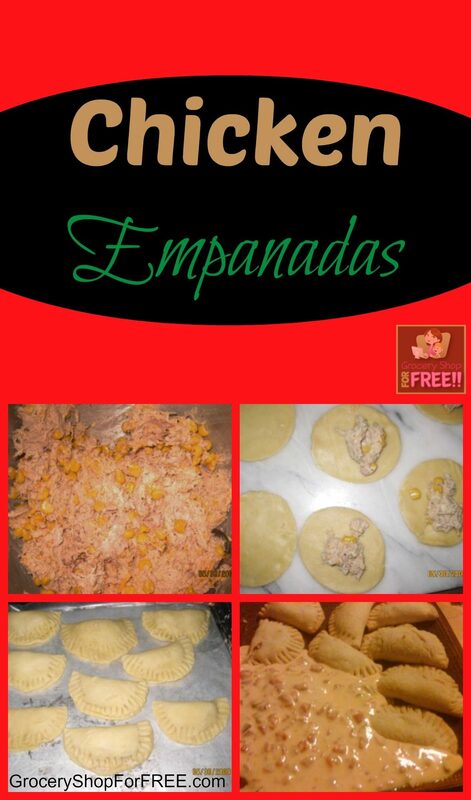 You are here: Home / Recipes / Dinner / Chicken Empanadas! One of my favorite revisions is my chicken empanadas. I hope you like these delicious little pastries. Boil 1 whole chicken (add bouillon for a little added flavor). Pull the meat off the bone. Toss the pulled chicken with your chosen seasonings. Add cooked corn and cream cheese to the mixture. Add shredded cheese (cheddar, Monterrey Jack, or Pepper Jack). Roll out your pie crust and using a cookie cutter, cut round circles. Spoon mixture into pie crust circles. Close circles by brushing with either egg or water and mash the edges together with a fork. Use a teaspoon or a tablespoon to spoon the mixture into the center of the circles. Bake in the oven at 350 degrees for 25-30 minutes or until golden brown. Serve with beans, rice, or cheese sauce! She just added queso on the side – I LOVE queso!